The Motorola Photon 4G is by far the best Android phone on Sprint. One could argue that's an easy statement to make, since Sprint's Android lineup has been largely uninspiring since they launched the HTC EVO 4G last summer. But the Photon truly is a great phone, marred only by spotty, and battery sucking, 4G coverage. Similar to the Motorola Atrix on AT&T, the Photon also has the ability to double as a pseudo-computer, using an optional dock, keyboard and external monitor. Unfortunately, the Photon doesn't have the full laptop dock option of the Atrix, limiting this feature's appeal. And for those looking to travel overseas, the Photon has the added benefit of being a worldphone, with a sim card to operate on international GSM networks. Any Sprint customer looking for a top-of-the-line smartphone should look no further than the Motorola Photon 4G. The Motorola Photon 4G continues the trend of 4.3" display smartphones that actually feel very comfortable in your hand. While some may find it a little large at 5.00" x 2.63" x 0.48", the rounded corners and textured back make it easy to hold. It's also not the lightest phone at 5.67 ounces, but the weight is well balanced. Also notable on the Photon are the large textured buttons on the side volume control and the camera shutter — a welcome improvement over the tiny buttons on Motorola's Droid X2, which almost taunt you with their inaccessibility. It would have been nice if Motorola had continued the textured effect with the top power button, as well. The Motorola Photon 4G has a high-resolution 4.3" "qHD" (960 x 540) display covered with nearly-unbreakable Gorilla Glass. The display was clear and bright, with great resolution. Colors were bright and accurate, and off-axis viewing was also very good, though the display gets washed-out in direct sunlight. The built-in speaker was very good, but people on the other end said they had trouble understanding me with the built-in mic during speakerphone mode. Call quality was otherwise very good. The Photon has a mini-HDMI out on the side so you can watch your content on your big screen, or you can purchase the optional HD Station ($99) that lets you connect up to three USB peripherals (more on that below). There's also a kickstand on the back of the Photon, so you can prop it up while watching. The big letdown for the Motorola Photon 4G is the mediocrity of Sprint's 4G network, at least in my New York City testing. On those occasions when I was able to connect to 4G, download speeds averaged around 3Mbps, with a peak at 6.5Mbps. That's slightly faster than what I get on T-Mobile and AT&T's 4G network, but far below Verizon's 4G LTE. The more frustrating issue was that I frequently lost my 4G connection, even in Manhattan, and Sprint's 3G network is far slower than T-Mobile or AT&T. The Photon also drains the battery extremely quickly while on 4G, meaning most users will want to keep 4G off until you really need it. The Photon 4G can act as a mobile hotspot for up to eight devices. Using the hotspot requires an additional $30 per month fee from Sprint. The Motorola Photon 4G has an 8MP rear-facing camera that takes average pictures for a high-end smartphone. Colors were accurate (if a little muted) and photos were detailed, but there was quite a bit of noise, even in good lighting conditions. As on the Atrix, controls are very basic, with just a handful of scene modes and not much else. There is also a dual LED flash. On the front there is an .3MP VGA camera, which is unimpressive spec-wise, but actually took decent shots.. The 720p video recording from the Photon was pretty good for a smartphone. Video was smooth with none of the jiggliness or stutters common in other phones. The Motorola Photon 4G runs Android 2.3 Gingerbread, with several social media add-ins and other tweaks from Motorola. The good news is that none are obtrusive. The 4.3" display offers a well spaced keyboard, with both Swype and a multitouch keyboard built-in. The Motorola Photon 4G has a powerful dual-core processor that provided snappy performance in menus and programs. The Motorola Photon Atrix 4G comes with 16GB of onboard storage and a slot for up to a 32 GB microSD card. The Motorola Photon's battery life was poor in 4G mode. The battery barely lasted into the evening with normal usage and took a long time to charge back to full power. Turning off 4G helped considerably, but turning 4G on and off for when you need it is a pain. Perhaps Sprint should consider an external toggle button on their 4G phones given that this has been a general issue with Sprint 4G devices. Like the Atrix., the Motorola Photon 4G can double as a computer with its optional HD Station ($99). The HD Station has three USB ports to plug in a keyboard, mouse or other peripheral, and and HDMI-out for your monitor. Simply pop the Photon into the dock and the Photon will launch its webtop application. The webtop provides a windowed workspace to run all of your phone and Android apps, as well as a full Firefox 4.0 browser. The HD Station dock and webtop software worked very well. But since you need the dock, monitor and peripherals to make it all happen, it's not a practical travel solution. There's also the limitation that there is no way to emulate multitouch gestures in Android apps, so playing Angry Birds becomes tricky when you can't shrink the screen to get the slingshot and target in the same view. The Motorola Photon 4G is available for $199.99 from Sprint with a new, two-year customer agreement. Or you can pick it up from Amazon for $179.99. 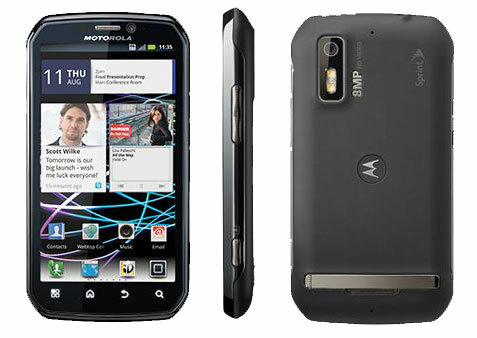 The Motorola Photon 4G is the best smartphone on Sprint, and offers the added flexibility of worldphone capabilities. From the way it fits in your hand, to its smooth operation, to the lovely 4.3" display, there's a lot to like. Depending where you live, its 4G capabilities will either be one of the biggest benefits or biggest drawbacks. You'll pay an extra $10 a month, regardless of whether 4G is available in your areas, and taking advantage of the 4G speeds will put a significant drain on your battery. I have a hard time figuring out the use case for the HD Station — it doesn't work well for travel and it's not going to replace a real laptop. But if you see the need, it's there for you. Overall, I highly recommend the Photon 4G to Sprint customers. Kind of silly when Sprint touts it as an International Travelers Android, not to have a Laptop dock one can easily carry with them. Guess Moto couldn’t get the price point for the trackpad at 99$ like the Webtop dock. Oh well my Photon is on delivery and I am excited that Sprint gave the thumbs up for this beauty even with SSG2 on the horizon. The Photon 4G is a nice phone. There are a lot of features on it that make it look and work better. Some of those would be the dual-core processor, 4G, and having the ability to travel to many different places. Any phone that I look at must be able to stream movies as well, and I think that the Photon would excel at this. The app that I have been using for a long time is the DISH Remote Access app. I love this app because it lets me stream live TV or recorded shows from my 922 SlingLoaded receiver to my phone anywhere I am! As a customer and employee of DISH Network, I have had a lot of time to play with the app so I know it will work wonders for the Photon 4G. This phone fully charged over night for 8 hours will last about a hour with light use. 30 mins with moderate use. and if you do not use it. at all it will lose its charge in about 2 and half hours. I got this phone through sprint. and i have return it 3 times..and all 3 do samething. this phone is pretty useless in my book unless u leave it constantly plug to a charger constantly. I am searching for a external battery case to solve the problem if not. I will toss it in trash and accept the 200 buck scam on the motorola phone and go with another phone. along with 200 scam from sprint to cancel service and back cricket. note consumers. the bad part with at&t, sprint in the likes..is they all partner together in fact with phone vendors to deliver you low quality phones with high cost service payouts that do not cover the real problems. As much as i loathe iphone and apple. and love andriod i think i will be forced to buy one just to have a phone that lastest without repeatitive charging. maybe some vendor will develop a android phone that accually is usable. I would pay 1,000 for a phone twice the size of a photon cash. even if it was twice the size as long as battery lasted…marketers should produce 1 andriod phone and see how sells goes. I am willing bet they would soar. My last take on this phone. it should be recalled or a battery case to fix the problem should be provided for free. The battery on this phone isn’t great, but there’s clearly something wrong with the phones you’ve gotten. Even using this phone as a mobile hotspot, it lasts for more than an hour. I would demand that Sprint resolve your issue either by getting you a working Photon or providing you a different model. It should be pretty easy to demonstrate the problem to someone in the store if it truly is as bad as you say. I just reviewed the Epic 4G Touch and was very impressed: https://www.techlicious.com/review/review-of-the-samsung-galaxy-s-ii-epic-4g-touch-sprint/. If you don’t need the worldphone capability, it may be the better choice. there is an external battery for sale!!! Camera is defective or might be THAT horrid. I upgraded from my EVO 4G, which I love snd still have, and while the EVO 4G camera is second to none in it’s superb quality, it is not that reason that I say this Photon’s camera is defective. It earns that descriptor all on it’s own. I noticed this on day one, returned it, got another one with same horrid ‘quality’. In well lit pictures/video, any area that is even remotley shaded has unusable ‘heavy static pixelation’ and it is barely evident in the well lit spots, but the ‘brightness’ covers the static defect. I decided to research it and found NO one talking about this, yet I see user uploaded videos/pics that do not have this defect, as well as pics/video that DOES have this defect, bit the user uploading the video/pic doesn’t appear to be aware of it and doesn’t even mention the horrible quality of the picture. Sprint and Motorola also appear to have no idea about this, which if it’s a bad batch, one eould think they would. Phone cameras have been a regular frustration for us. One model from a manufacturer may be great, another mediocre. You were happy with your HTC EVO 4G, but we were very disappointed by odd artifacts in the HTC Sensation, for example. Samsung has been the most consistent in producing very good cameras for their phones, though we’ve found the colors to be over-saturated. Apple’s iPhone also has a great camera, yet the iPad camera is miserable. No matter which phone you have, we still recommend that anyone who really cares about picture quality use a point-and-shoot, rather than your cell phone. Hi Josh. Thank you for your reply to such a dated topic. I am still in search of an acknowledgement of the camera defect. When a phone is advertised to have a camera as one of it’s selling points, it is a sad day when we allow company’s to have a pass when they release a horrible quality product. As for replacing a point-and-shoot (PS: I also own a Canon 60D DSLR), my EVO 4G did exactly that: Replaced my more feature-rich Fuji 12MP Finepix ONLY because I had my cell phone with me at all times, and the 8MP high quality pictures were so impressive, I did not feel I had any sense of “want” for my Fuji. The key point here is that if a phone’s camera is good enough (like on the EVO 4G), it is enormously convenient to never have to think to grab your regular point-and-shoot camera every time you leave the house “just in case” something picture worthy happens. I no longer had to ‘settle’ for the grainy pixelated shots my prior smart phone took when impromptu parties/events/etc took place around me. Indeed, the pictures I took with my EVO, people were incredulous that I had taken them with a cell phone camera. It would be great if all cell phones had a great camera, but they don’t, for reasons of cost, design or otherwise. We try to call out the quality in our reviews so consumers can make their own decision about whether it is a deal breaker or deal maker, depending on their personal needs. No phone is perfect, and users can decide what features matter most to them. Even great cell phones cameras still don’t have optical zooms and are often slower shot-to-shot than a point-and-shoot. So when the pictures really matter, we turn to our point-and-shoots and DSLR. But you’re right - the best camera to have is always the one you have with. Even a Canon 60D won’t take great photos if it’s sitting at home. However, I have been reading forums and posts that discuss the numerous problems with the photon, specifically, constant reboots, and problems with calls where one party could not here the other. Have you done any long term testing, and, if so, have you experienced any of these problems?